EVERY major government study for over 50 years has concluded that marijuana should be decriminalized or legalized. The National Commission on Marihuana and Drug Abuse (the Shafer Commission) had 13 members, most of them hand picked by President Nixon to affirm his view of marijuana as a menace. After long study, they opted for the truth instead. "We ask the reader to set his preconceptions aside as we have tried to do, and discriminate with us between marihuana, the drug and marihuana, the problem. "Recognizing the extensive degree of misinformation about marihuana as a drug we have tried to demythologize it. "No valid stereotype of a marihuana user or non-user can be drawn. "The most notable statement that can be made about the vast majority of marihuana users - experimenters and intermittent users - is that they are essentially indistinguishable from their non-marihuana using peers by any fundamental criterion other than their marihuana use. "Young people who choose to experiment with marihuana are fundamentally the same people, socially and psychologically, as those who use alcohol and tobacco." "Most users, young and old, demonstrate an average or above-average degree of social functioning, academic achievement, and job performance. "Neither the marihuana user nor the drug itself can be said to constitute a danger to public safety." "As someone acknowledged as a specialist in drug actions on the brain, I know a great deal about cannabis and how it affects its users, and I know that there are simply not the facts to stand up outrageous statements like this.
" It is headline-grabbing rubbish. "When I advised the House of Lords committee five years ago that cannabis was not as damaging as, for instance, regular smoking or drinking, no one wanted to know about our findings. "Cannabis is simply not as dangerous as it is being made out to be." " Under an emergency clause the city council adopted the marihuana ordinance prohibiting the sale, barter, exchange, giving away and having in possession the deadly drug. The ordinance makes it unlawfully for any person, firm or corporation within the city limits to handle the drug. The grounds for the emergency passage of the ordinance, it was stated, were the dangerous and powerful properties of the drug and the increasing sale of it in the city. Mayor Tom Lea instructed City Attorney W. B. Ware to act in conjunction with the police in seeing that the ordinance was enforced. A punishment by fine not to exceed $200 is provided. It is due to the efforts of Chief Deputy Sheriff Stanley Good, Sr., that the city took steps to prohibit the traffic in marihuana. The drug is considered the most deadly of any known and while there are laws prohibiting the sale of morphine and kindred drugs there was never any provision made against the dealing in marihuana. Marihuana is known to create in users a lust for human blood. The most atrocious murders committed in El Paso have been attributed to marihuana fiends. The sales of the drug recently assumed such alarming proportions that Good took the matter up with the city government." ... numerous internet sites contend that El Paso was the first to enact such an ordinance. The date given for the enactment is variously stated as being 1913, and sometimes 1914. I checked the Charter and Penal code of the city of El Paso, 1917 and found codified in Section 53 thereof "Sale of Marihuana Prohibited: It shall be unlawful for any person, firm, corporation or association of persons to sell, barter, exchange, give away, or have in his possession, within the city limits of the City of El Paso, Texas, any marihuana of Indian hemp." Section 54 provided "Any person who shall violate any provision of section (53) of this ordinance shall be punished by a fine of not more than Two Hundred ($200.00) Dollars." The citation for these sections is given as June 3, 1915; Book E-2, p. 611, sec. 1 and 2. I can find nothing showing that the City of El Paso first enacted anti-marihuana legislation prior to June 3, 1915. The same nonsense was offered by H. Anslinger (head of the Federal Bureau of Narcotics [FBN] ) in testimony to Congress to justify marijuana prohibition in 1937. (People were warned in the 1920s not to use cocaine or heroin because they were the "gateway" to marijuana.) By 1954 Anslinger would testify that marijuana prohibition must be continued because marijuana made users so peaceful that they would not fight communists. Sigh. "I witness the adverse health effects of licit and illicit drugs daily. As emergency physicians, we are the ultimate realists. We know that the prohibition of marijuana is a failed public health policy." The California Medical Association in October declared the criminalization of marijuana to be a failed public health policy. Its assessment is appropriate. Marijuana prohibition is a classic case of the so-called cure (criminalization) being worse than the disease (the private recreational use of marijuana). Consider the questionable efficacy of our present policy. Forty-three percent of Americans over the age of 12 admit to having used marijuana, and nearly one in 10 Californians use it now. At an estimated $15 billion, marijuana is California's largest cash crop. Now let's consider the costs of prohibition. In the Golden State, taxpayers spend $300 million annually to arrest and prosecute 60,000 people -- largely Latinos and African-Americans -- for possessing minor, recreational amounts of marijuana. 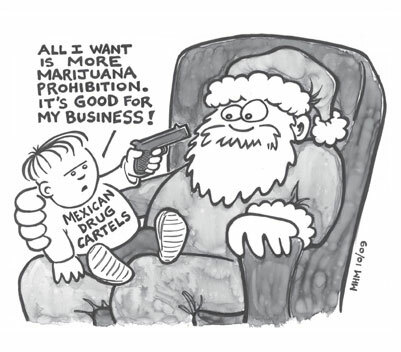 Prohibition is also empowering drug cartels, particularly criminal enterprises in Mexico, which now reap between 60 percent and 70 percent of their total revenue from the exportation of marijuana to America and threaten to turn Mexico into a "narco" state. So what's the alternative? In my opinion, it is the passage of Proposition 19, which would legalize, regulate and tax the adult possession, use, production and distribution of marijuana in a manner similar to alcohol. I do not come to this position cavalierly. I am a board-certified, career emergency physician who witnesses the adverse health effects of licit and illicit drugs daily. Yet the recent RAND report on the financial impact of Proposition 19 reaffirmed my belief that the legalization and regulation of marijuana would make our communities safer and more just. According to RAND, fewer than 200 total patients were admitted to California hospitals in 2008 for "marijuana abuse or dependence." This relatively low number did not surprise me. In my 35-plus years as an emergency physician in busy ERs in Northern California, I have never needed to admit a patient due to an adverse reaction or medical problem caused by marijuana. Personally, I have taken care of fewer than 10 patients during my entire professional career whose chief complaint was related to marijuana. Mostly these were parents who were cajoled to smoke by their teenage kids and then experienced an anxious reaction. One hysterical woman called 911 because her dog had eaten a baggie of marijuana. Both the patient and the dog ended up fine. Comparing the health care consequences of marijuana to the health care consequences of alcohol is startling. In 2006, there were 72,771 hospitalizations in California related to the use of alcohol. Of these, 34,292 hospitalizations were due to illnesses or chronic conditions caused by alcohol consumption. This total is roughly 200 times the number of hospital admissions associated with marijuana. From a physician's perspective, marijuana is a minor ailment. The supposed cure, criminalization, is like the IV administration of a toxic, expensive antibiotic to treat a cold. An adverse effect of the inappropriate and ineffective use of antibiotics is the growth of drug-resistant bacteria. The adverse effect of criminalization of cannabis is that is stigmatizes 60,000 people a year as criminals. As emergency physicians, we are the ultimate realists. We know that the prohibition of marijuana is a failed public health policy. California's nearly 100-year-old war on marijuana is an expensive failure. Let's get real: Legalize, regulate, control and tax marijuana. As physicians we know the best way to deal with marijuana dependency is by education and treatment, not by criminalization. A group of more than 500 distinguished economists -- led by Nobel Prize-winner Dr. Milton Friedman -- released an open letter to President Bush and other public officials calling for "an open and honest debate about marijuana prohibition." "Existing evidence ... suggests prohibition has minimal benefits and may itself cause substantial harm." "We believe such a debate will favor a regime in which marijuana is legal but taxed and regulated like other goods." Time for a change in marijuana laws? "For many decades, marijuana has been the American poster child for how not to deal with a troubling psychoactive substance." "Although far from harmless by toxicological or pathologic criteria, marijuana is much less dangerous than many other substances in less restrictive schedules, like morphine and cocaine, not to mention the unscheduled legal mass killers tobacco and alcohol." "Of course, marijuana does have proven medical usefulness for some conditions," said Lundberg, citing the New England Journal of Medicine. "Kids quickly see through lies. Many kids may discount the proper scare tactics about really dangerous drugs, like heroin and PCP, because the dangers of marijuana have been so overstated." "In fact, enforcement of unrealistic laws regarding marijuana has probably caused more harm than marijuana itself. "People obey laws they believe to be just; they do not obey the marijuana laws because they know they are unjust, even absurd." For many decades, marijuana has been the American poster child for how not to deal with a troubling psychoactive substance. By US law, a Schedule I substance is one with no recognized medical use and great potential harm to the user. Marijuana has been classified as a Schedule I substance for many decades, along with heroin and LSD. Judging from its easy availability, low cost, and widespread current use, such a restrictive classification has failed to retard its use. In fact, enforcement of unrealistic laws regarding marijuana has probably caused more harm than marijuana itself. Although far from harmless by toxicological or pathologic criteria, marijuana is much less dangerous than many other substances in less restrictive schedules, like morphine and cocaine, not to mention the unscheduled legal mass killers tobacco and alcohol. Of course, marijuana does have proven medical usefulness for some conditions. People obey laws they believe to be just; they do not obey the marijuana laws because they know they are unjust, even absurd. Kids quickly see through lies. Many kids may discount the proper scare tactics about really dangerous drugs, like heroin and PCP, because the dangers of marijuana have been so overstated. Ninety percent of Americans believe that the federal government should not prosecute medical users of marijuana, despite the newest "federal foolishness" of the recent Supreme Court decision against it. This commonsense position of the people should give pause to any overzealous prosecutors who might have real trouble finding a jury that would convict a seriously ill user of medical marijuana. The court decision now provides the Congress and the Drug Enforcement Administration with a sterling opportunity to join with the population they are supposed to be serving and with the good science of the 10 states that have authorized the controlled use of medical marijuana and reclassify it at some level other than Schedule I. That's my opinion. I'm Dr. George Lundberg, Editor of MedGenMed. 1. Department of Justice. Drug Enforcement Administration. Marijuana scheduling petition: denial of petition: remand (Pocket No. 86-22). Fed Regist. 1992;57:10489-10508. 2. Kassirer JP. Federal foolishness and marijuana. N Engl J Med. 1997;336:1184-1187. Available at: http://content.nejm.org/cgi/content/short/336/5/366 Accessed August 19, 2005. Readers are encouraged to respond for the editor's eye only or for consideration for publication via email: glundberg@medscape.net . Please include the title of the Webcast Video Editorial that you are responding to in the subject line of your email. Disclosure: George D. Lundberg, MD, is an employee of Medscape, LLC. The AMA justifies Lundberg's firing on the grounds that he allowed the journal to stray from "science and medicine" into politics. Newspapers across the US have been quick to point out that the AMA is a political organization. Since 1989 the AMA Political Action Committee has given more than US$14 million to US Senate and House candidates; these donations have favoured Republicans over Democrats by a ratio of 2 to 1.3.